I haven't done many walkalongs about new papers, so let's review a new paper from Charles Zuker's lab. First, two pieces of background. There are two diametrically opposed theories of taste coding. The "labeled line" theory states that each taste quality (sweet, salty, bitter, etc.) is encoded by a single cell type, and individual cells respond to single taste qualities. 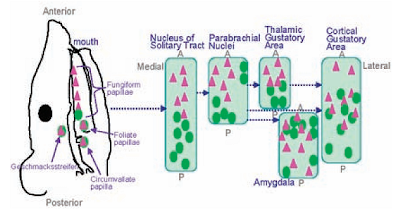 In contrast, the combinatorial, or "across fibre," theory states that taste is encoded in the population response of neurons, and individual neurons can respond to multiple tastants. In general, taste coding shifts from a labeled line representation to a combinatorial representation as information flows from the tongue to the CNS. The taste receptors for most taste qualities have been identified, and recordings of the nerve fibres that project from the tongue show each fibre encodes one taste quality. In contrast, recordings from the brainstem, thalamus, and gustatory cortex have found that individual neurons can respond to multiple tastants. The number of taste responsive cells can change depending on your criteria: only ~10% of gustatory cortex (GC) neurons respond tonically (longer than 1s) to taste application, while 30-40% respond if you consider phasic responses, inhibition, or ensemble coding. The second piece of background you need to know about are the idea of cortical maps. In visual, auditory, and somatosensory cortex, there is a clear organization of physical space in the cortex. For example, in visual cortex, a picture of the world is mapped onto a corresponding 2D map of visual cortex, called retinotopy. Similarly, the body is mapped from head to toe in the somatosensory cortex (with the tongue area abutting taste cortex). In contrast to those well-organized cortices, odors do not seem to be chemotopically organized in olfactory cortex. 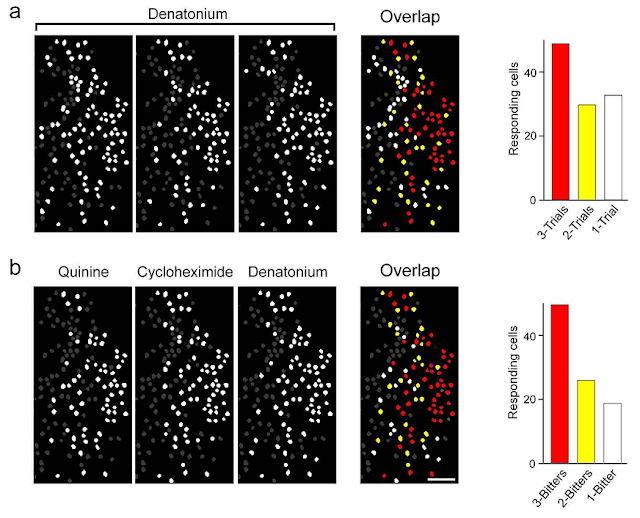 The Carleton lab has attempted to image taste maps in gustatory cortex using intrinsic imaging. They found that individual taste qualities were represented in segregated areas, but that there was significant overlap between areas. Furthermore, the pleasant and unpleasant tastes seemed to somewhat separated. Taste qualities are vaguely mapped in the gustatory cortex of rat, with pleasant qualities anterior, and unpleasant qualities anterior. From Carleton et al, 2010. With that background, we can look at the Chen paper. They performed calcium imaging in taste (insular) cortex, which allows one to image the activity of dozens of cells at the same time. Taste cortex is on the lateral side of the brain, so to access this area you have to remove the cheek-muscle, and turn the animal on its side. The authors noted in the supplemental methods that only one-in-four animals were usable after these manipulations. While they were imaging, they applied tastants for sweet, salty, bitter, etc. and found that most of the purported taste cortex was unresponsive. However, they identified a portion of posterior insular cortex that responded well to bitter tastants, which they dubbed a bitter hotpot. There is a bitter hotspot in posterior insular cortex. A/B. Individual neurons in the bitter hotspot respond to bitter tastants (red/white dots). E. Approximately 30% of neurons in the bitter hotspot respond to bitters, while few respond to other tastants. 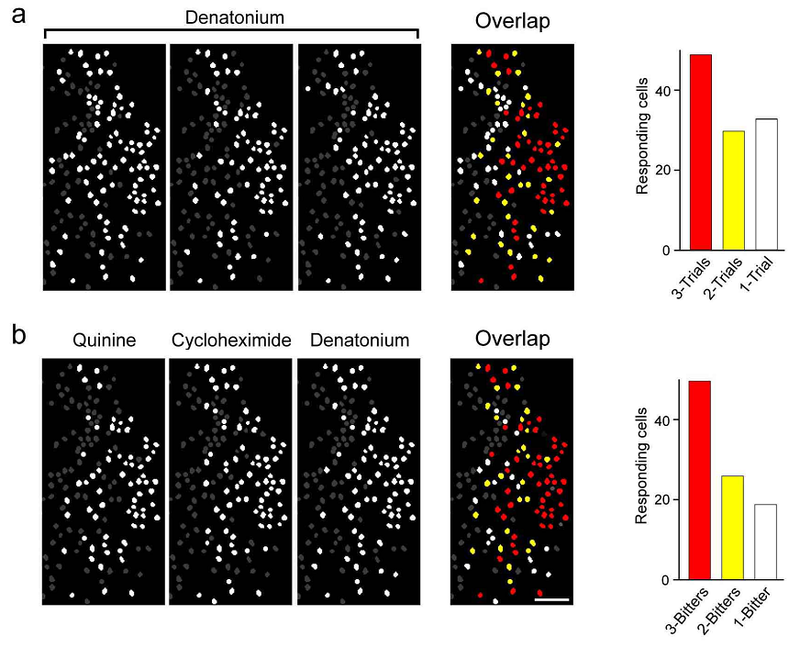 G. Calcium response of individual cells show they are selectively tuned to bitter tastes. From Chen et al, 2011. 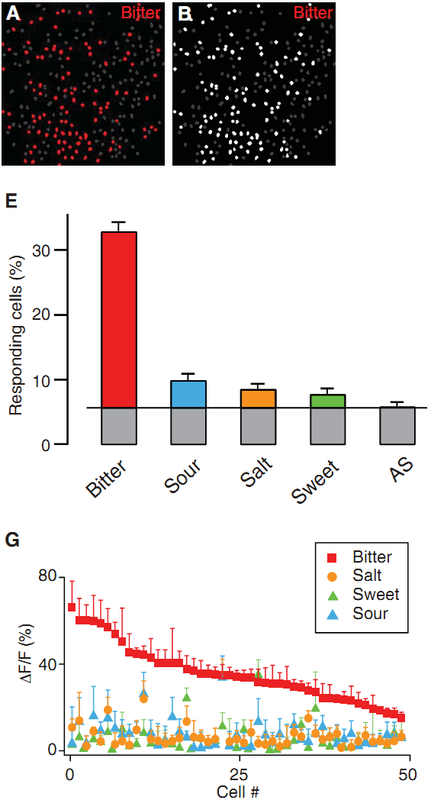 In the bitter hotspot, approximately 30% of the neurons responded to bitter tastant, while less than 10% responded to other tastants like sweet or sour (panel E/G). The hotspot was approximately the size of their imaging area. They performed a neat experiment to verify that this was a bitter hotspot. There are ~36 bitter receptors in mice, each of which responds to different bitter compounds. One receptor, T2R5 is the only receptor for cycloheximide. So they imaged T2R5 knockout mice, and found that the bitter hotspot no longer responded to cycloheximide, but still responded to other bitters like quinine. From here, we diverge into the supplemental figures. First, I want to mention the reliability of the responses. They performed 4-7 trials for each tastant, and considered a cell responsive if it responded in two of four trials. In a supplemental figure, they applied a bitter tastant three times, and noted that some cells responded during all three trials, while others responded only once or twice (panel a, below). I realize that any response is going to be noisy, but it is somewhat troubling that there is a 30-60% "failure" rate of bitter responses in the bitter hotspot. Responses of neurons in the bitter hotspot during multiple trials, and to multiple bitters. a. In the bitter hotspot, many cells respond to only 1 or 2 trials (the % of cells was not given). b. Many neurons respond to three bitters tastants, while others respond only to a subset. Given the diversity of bitter receptors, they also looked at how different bitter compounds are represented in the bitter hotspot. They applied three bitters, and found that many cells responded to all three, while other cells responded to only one or two of the bitters (panel b, above). This may have implications for how you interpret whether these cells indicate a labeled line model. If the labeled line is "bitter," then each cell should respond to all bitter compounds. However, there could be individual labeled lines for bitter subcomponents. Yet, here there are cells that respond to multiple bitters, which would be a combination of labeled lines. In another supplemental figure, they used a tungsten electrode to record from neurons inside and outside the hotspot. 13 of the 31 neurons recorded in the hotspot responded to bitters, and nothing else, while only 1 of 39 neurons outside the hotspot responded to anything. Electrical recordings of neurons near the bitter hotspot. a. Map of recording sites. Unresponsive neurons outside the hotspot shown in black, bitter neurons in red, and unresponsive neurons inside the hotspot in white. c. (left) PSTH of neurons inside the bitter hotspot, and (right) firing rate change of these neurons. b. Average firing rate changes for responsive neurons inside the hotspot and all neurons outside the hotspot. From Chen et al. 2011. I have to say, this is an odd figure. The characterization of the firing rate change in terms of "delta spikes / 5s," seems weird; if you divide by the 5s, you get a rate change of 2 Hz, which is neither impressive nor terrible. The responses shown in panel c above are not that convincing, especially considering they're probably the best responses they have. Furthermore, they didn't note the depth they're recording from. Remember this when considering what a "responsive" neuron is. After focusing on the bitter hotspot, they also found hotspots for three other taste modalities: sweet, salty, and umami. In each of the areas, ~30% of the neurons responded to the relevant stimuli. In the left panel, below, you can see that these generally pleasant areas are all rostral (anterior) to the bitter hotspot. They could not find a sour hotspot. Non-bitter hotspots. E. Sweet, salty, and umami hotspots are all anterior to bitter. F. Cells in the salty hotspot respond to NaCl, but not other salts (KCl, or MgCl). This response is blocked by the sodium channel blocker amiloride. Phew, that was a long one. It's sad that this was a Science paper, where so many interesting figures were shoved into the Supplement where no one will see them. Notably, existing models of taste coding in the insula included proposals of broadly tuned neurons across taste qualities ... with no region dedicated to the processing of only one taste quality. Although we cannot rule out the existence of sparse numbers of broadly tuned cells distributed throughout the taste cortex (i.e., nonclustered), our results reveal that the individual basic tastes are represented in the insula by finely tuned cells organized in a precise and spatially ordered gustotopic map, where each taste quality is encoded in its own (segregated) stereotypical cortical field. They have convincingly shown that there are hotspots in taste cortex, with pleasant tastes represented rostrally. This is in agreement with the previously shown intrinsic imaging, as well as with genetic tracing studies. This is a pretty cool study, so I had to include it. They made mice expressing wheat germ agglutinin (WGA) in T1R3 and T2R5 taste bud cells. 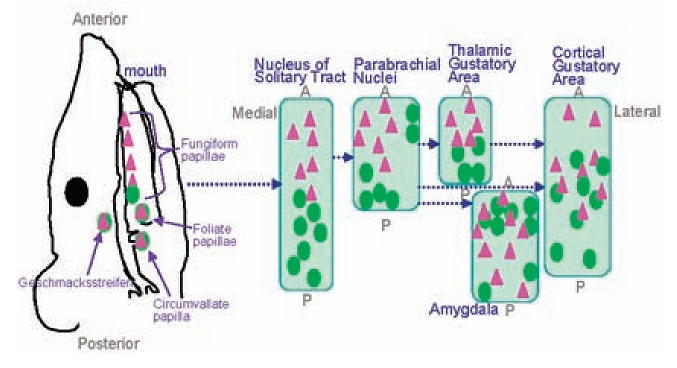 WGA can cross synapses, so it's able to go to all the cells that are downstream of the taste receptor. They found that the sweet (triangle) and bitter (circles) cells were generally segregated in the brainstem and thalamus, but started to overlap in the cortex. Still, the sweet was generally anterior to the bitter. From Sugita and Shiba, 2005. However, I must disagree that they have shown GC neurons are "finely tuned." Repeated recordings from multiple labs throughout the brainstem, thalamus, and cortex have shown that taste neurons respond to multiple taste qualities. However, these responses are complex, including short responses, inhibition, and coordinated firing. If you restrict your definition of "taste responsive cells" to those that have a tonic firing rate increase, only 10% of GC neurons are responsive, and these responses are generally to few taste qualities (left panel, below). If you expand your definition to include phasic firing, inhibition, and other types of coding, neuronal tuning becomes more broad (right panel, below). "Taste responsiveness" depends on the time window. Left: 13 neurons response to tastants, averaged over 2.5s. Here you can see the neurons respond to few tastants. Right: Two neurons' responses to tastants in 500ms bins. 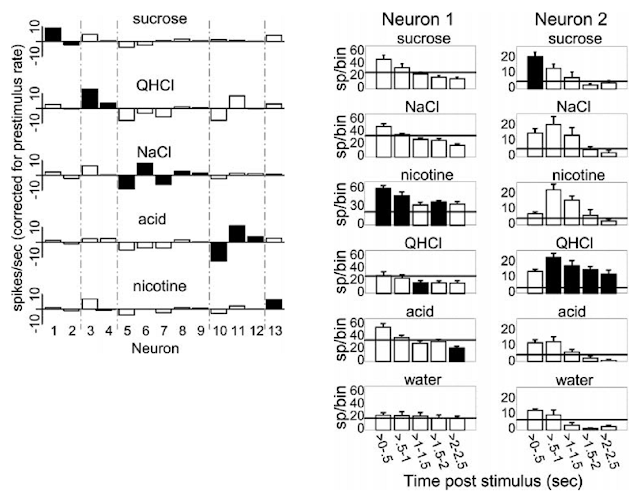 Here, the neurons respond to different tastants at different times. From Katz et al, 2001. For more, see here. Calcium imaging is a great tool for asking very specific questions, like looking at spatial maps, or sampling many cells simultaneously. It is poor at characterizing fast temporal responses. They are imaging at 2Hz, and quantifying responses over ten seconds, which will miss those dynamics. Furthermore, Ca2+ imaging acts as a filter, only reporting the strongest activity. Of course they found few responsive neurons responsive, and those responses were sparse. Those were the only neurons they can find. What does the rest of the insula do? the inter–hotspot regions might be involved in other aspects of taste coding , such as the representation of taste mixes, and thus may help to code the perception of “flavor ” [e.g., responding to several tastes simultaneously]. In addition, the insular cortex responds to more than just taste, and it is often thought of as a site for multisensory integration. Thus, these areas may participate in the integration of taste with the other senses. If I may reinterpret their results: GC contains neurons that respond to a startling diversity of stimuli: somatosensory, olfactory, hedonic, motor, and taste. Previous recordings have shown that GC responses are quite phasic, and decay within one lick. However, a select subset of GC neurons have long-lasting taste responses, which have been sampled here. These specifically gustatory neurons seems to cluster together, with "unpleasant neurons" in the back, and pleasant to the front. They also speculate that, in contrast to e.g. vision, taste maps are more developmental than functional, which would be in accord with Sugita's findings. My paper-muscles are exhausted. I am glad to see taste get a high profile paper. Hopefully it makes it easier for the rest of us.